Evan Burton is a UX Designer, Usability Engineer, Data Science Enthusiast, finishing a master’s degree in Usability Engineering. He’s currently writing his masters thesis on corporate intrapreneurship and innovation, with a focus on corporate acceleration and incubation, and how to best support intrapreneurs in the process of defining and developing their ideas into products or services for their company. Evan will be publishing his thesis as an advanced journal paper in Creativity and Innovation Management within the next few months. In the mean time, I share here the conversation we had about the importance of coaching along the Orange Intrapreneurs Studio program. Evan: How does the Intrapreneurs Studio work? First is the Online Application: Orange employees (all 150,000 employees are welcomed) apply with their innovative ideas for Orange business. We receive around 100-150 applications online, and we pre-coach during the application process around 30 projects. The third stage Incubation, which can last from 12 to 24 months, and whose focus is to bring the idea to the market. Evan: What are your coaching responsibilities? Nicolas: My responsibilities are split between incubation coaching, supporting the one who are selected for incubation, and application coaching, the ones applying for the next season. We pre-coach them to be qualified for the the second stage, the ten days qualification stage. When the project goes to Qualification, and then to Incubation, he usually keeps the same coach. Then there is a ten days qualification stage where we provide face to face coaching to 10 to 15 projects, it’s quite a preview of what will be the incubation coaching. There are about 4 to 5 coachs for the 15 projects, but the intrapreneurs progress also with the help of their colleagues. It’s very much teamwork. So one intrapreneur is helping another intrapreneur and create this way a kind of classmate and graduating class, which they give a name to. The first intake was named David Bowie, the second one Gabrielle Chanel! Evan: Can I ask you how involved the coaches are in this phase? Are they actually working directly on the products or are they just kind of overseeing what kind of role? Nicolas: They do both, they facilitate efficient workshop, keeping explaining the innovation methodology, explaining the theory. But once the intrapreneur starts fulfilling, they go from one group to another, and they challenge the in-depth, the value proposition, the customer target, the synergies with Orange, the resources required, or the appropriateness of the MVP that the intrapreneur has in mind. And last, we coach them on the pitch that they will deliver at the end. Finally, we really try also to coach on test and learn approach, very much about the iteration of their concept, and getting things done, and being rather a doer and not only a thinker. Evan: Okay great. Can you tell me a little bit about the qualities that you look for in coaches, what you think makes a good coach and what, their qualities are well? Nicolas: The 4 dimensions that we have in mind for an intrapreneurs’ coach profile correspond to the 4 activities previsously descrive: innovation skills, networking within Orange, human relationship abilities, and the being ready to work. Intrapreneurs’ coachs have to leverage innovation skills: background in the innovation division can be appropriate. They have to develop the network of the intrapreneur: a good knowledge of Orange local entity or miscellenous entities is something that is valuable, so we look for some people who have experience in the company. Visibility within the company, and also some experience in leading an innovation project, is a nice match. Evan: how important do you think the coachs are for the intrapreneurs? We had a first experience for the incubation during season 1. We had some kind of light coaching, and after six months, we realized that intrapreneurs were really lacking coaching. Insufficient coaching leads to fuzzy result. They were lacking the coaching in terms of methodology, they had some trouble identifying what was the MVP, and how to have user testing MVP. You know, it’s not enough to build the minimum viable product, you have to get the users to validate it! It’s more a marketing approach to on-board people on your MVP: targeting the user and recruiting, onboarding the users to interact with the MVP turn to be tricky. Another difficulty was to really sort out a minimum product, as intrapreneurs have a tendency to add always more features. It’s a kind of reinssurance. So for season 2, we have decided to implement more tight, and intense coaching. We see the intrapreneur face to face much more often on their project, on a weekly basis. We also have once a month an kind of replication of the work that we do during the qualification stage. I mentioned that we work in groups, in teams, intrapreneurs working on their project and also on the project of all the other intrapreneurs, was a very fruitful configuration. We extended this with cross-projects meeting: in incubation for season 2, we have set up this kind of meeting to prolongate the spirit of the qualification, and to let intrapreneurs enrich the work of one another. We have regular cross project meeting on a monthly basis. It’s a one-day or half-day meeting on the canvas, on how to onboard on the MVP, and the how to structure a business plan, that kind of things, and we call to this meeting all the older projects that are being currently incubated, to share experience. It’s been key for us to maintain the spirit of the graduating class. Innovation is a discipline, and it requires the help of coach for intrapreneur to become innovators. Evan: Maybe just a few more words about linking to the company. Could you dig into that a little deeper like how you actually connect people to the to the company to other employees. 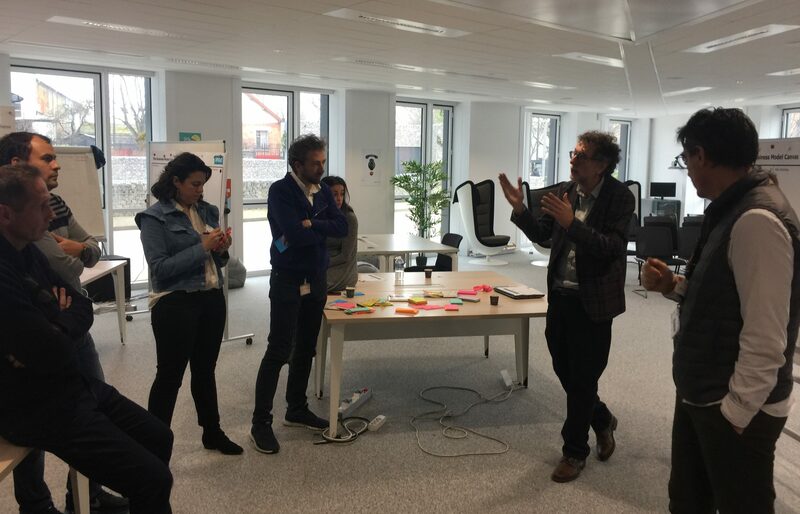 Nicolas: It’s connecting the project to Orange business entities, and investigate synergies: what kind of opportunities is creating the intrapreneur’s project for his business partner? That is the networking part, on one side aggregating associates, on the other side identifying channel of commercialization, dedicated salesforce, point of sales, marketing support, and so on.